Interested in a career with a company who values your identity and culture? A company who’s committed to a diverse workforce, while offering unique opportunities and professional growth. A company who supports and encourages employees from a shared background and culture to help drive understanding, empathy and change. If so, ICBC may be right for you. 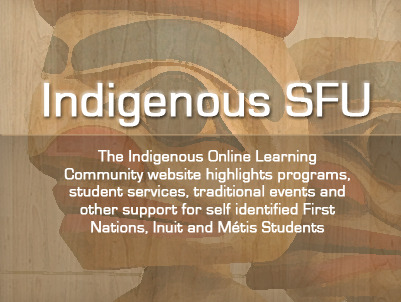 The 2nd Annual SFU Indigenous Day at the SFU Burnaby campus was a huge success! Here is a recap of the event. The CEO & President of the Aboriginal Human Resource Council, Kelly J Lendsay will be speaking to Indigenous students about how the Aboriginal Inclusion network can help you find the right job, the right employer and build a career path that feeds your passion and emphasizes your talent. Aboriginal women and their children are among the most discriminated against and socially and economically disadvantaged living in Vancouver’s Downtown Eastside. The Aboriginal Mother Centre offers a safe and caring long-term home and all of the resources necessary to assist mothers and their children in realizing a brighter future. Beverly PITAWANAKWAT, an RCMP constable with the First Nations Policing Unit for the community of Chehalis, she shares her career story, and offers advice and requirements for Aboriginal youth hoping to join the RCMP. Round Lake Treatment Centre is funded by the Governments of Canada and British Columbia through grants provided by First Nations & Inuit Health Branch and Interior Health Authority. Round Lake provides residential addictions treatment for persons in recovery. Find out how to become part of thier team. Canadian Imperial Bank of Commerce (CIBC) is dedicated to providing financial services to North American Indian, Inuit and Metis people through our Aboriginal Banking Team. Join this team of experts and you’ll bring the new skills and training we provide to help meet the changing and diverse needs of the people in your community. More than just a job! Join our public safety team! At the Correctional Service of Canada (CSC), putting in a day’s work means helping to keep your community safe. We strive to deliver a seamless, consistent and rewarding employment experience globally by developing policies and programs based on shared global principles. Vancouver Aboriginal Child & Family Services Society is a non-profit society providing service to urban Aboriginal children and families living in the Greater Vancouver area. We function across three offices as the largest designated urban Aboriginal agency in Canada. Bold Eagle is a challenging yet rewarding opportunity that helps to develop valuable skills such as self-confidence, self-discipline, teamwork, time management, respect and fitness to list but a few. Join our organization to help narrow the health gap between Aboriginal and Non-Aboriginal patients and residents by providing a better cultural fit within Fraser Health.